Newsletter 2017, Issue 3. Homeschooling: Assessing Progress Over the Holidays and Teaching Tolerance and Embracing Diversity. Newsletter 2017, Issue 2. Homeschooling: What Should I Teach When and New Additions to Our Site. Newsletter 2017, Issue 1. Avoiding Homeschool Burnout and LGBT Books for Kids and Teens. Newsletter 2016, Issue 1. Teacher's Guide for Last Stop on Market Street. Newsletter 2015, Issue 1. Art, Crafts and Artists. Newsletter 2014, Issue 4. New Additions to the Site. Newsletter 2014, Issue 3. Death, Dying and Grief through Chidlren's Books. Newsletter 2014, Issue 2. Lois Lowry: Featured Author. Newsletter 2014, Issue 1. Racism, Animals and More for grades PreK through 9th. Newsletter 2013, Issue 3. Humor, Space and More for grades PreK through 9th. Newsletter 2013, Issue 2. Fairy Tales and Folk Tales for grades PreK through 9th. Newsletter 2013, Issue 1. Book Reviews. Newsletter 2012, Issue 2. Sports. Newsletter 2012, Issue 1. Featured Author: Richard Peck. Newsletter 2011, Issue 2. Insects and Spiders. Newsletter 2011, Issue 1. Snow, Winter and Weather. Newsletter 2010, Issue 5. Book Reviews. Newsletter 2010, Issue 4. Three New Featured Book Teacher Guides, Grades PreK through 8th. The Tiny Seed, Catwings, and Wringer. Newsletter 2010, Issue 3. Mysteries in the Classroom, Grades PreK through 9th. Newsletter 2010, Issue 2. Book Reviews, Grades PreK through 10th. Newsletter 2010, Issue 1. Deserts through Kids' Books. Literature Based Classroom Unit. Grades PreK-9. Newsletter 2009, Issue 7. Book Reviews. Newsletter 2009, Issue 6. Featured Book Article on Where the Wild Things Are with activities, related books and links. An Author Study of Maurice Sendak. Newsletter 2009, Issue 5. Teaching History with Time Travel Fantasies. Newsletter 2009, Issue 4. Book Reviews. Newsletter 2009, Issue 3. Picture Books in the Math Curriculum. Newsletter 2009, Issue 2. Reviews of New Children's Books. Newsletter 2009, Issue 1. 200th Birth Anniversary of Abraham Lincoln and Charles Darwin. Newsletter 2008, Issue 3. Reviews of nonfiction titles and web links. Newsletter 2008, Issue 1. Reviews of books (Novel, picture book, nonfiction, professional and more). Newsletter 2007, Issue 1. Nory Ryan's Song by Patricia Reilly Giff. Newsletter 2006, Issue 1. Reviews of New Release Books. Newsletter 2005, Issue 3. Featured Book: The Breaker Boys by Pat Hughes. Newsletter 2005, Issue 2. Featured Book: Kira-Kira by Cynthia Kadohata. Newsletter 2005, Issue 1. Featured Book: Olive's Ocean by Kevin Henkes. Newsletter 2004, Issue 8. Featured Subject: The Holocaust. Newsletter 2004, Issue 6. Featured Book: Charlotte's Web by E. B. White. Newsletter 2004, Issue 5. Featured Book: Look to the North by Jean Craighead George. Newsletter 2004, Issue 4. Featured Book: Miss Bridie Chose a Shovel. Newsletter 2004, Issue 3. Featured Author: Susan Goodman. Newsletter 2004, Issue 2 Attaboy, Sam! by Lois Lowry. Newsletter 2004, Issue 1 The Man Who Walked Between the Towers by Mordicai Gerstein. Newsletter 2003, Issue 9 Weather in Kids' Books. Newsletter 2003, Issue 8 A Killing in Plymouth Colony by Carol Otis Hurst and Rebecca Otis. Newsletter 2003, Issue 7 Letting Swift River Go by Jane Yolen. Newsletter 2003, Issue 6 contains the featured subject: Slavery in Children's Books. Newsletter 2003, Issue 5 contains the featured book: Far North by Will Hobbs. Newsletter 2003, Issue 4 contains the featured author: Mitsumasa Anno. Newsletter 2003, Issue 3 contains the featured book: In Plain Sight by Carol Otis Hurst. Newsletter 2003, Issue 2 contains the featured subject: Folk and Fairy Tales, Tongue-in-Cheek Versions. Newsletter 2003, Issue 1 contains the featured book: The Keeping Quilt by Patricia Polacco. The Keeping Quilt by Patricia Polacco. The November Newsletter contains the featured subject: Kids' Books Set in School. Kids' Books Set in School. The October Newsletter contains the featured title: Keeper of the Doves. Keeper of the Doves by Betsy Byars. The September Newsletter contains the featured subject: Biographies and Memoirs. The August Newsletter contains the featured subject: Reading Aloud grades PreK - 9. Reading Aloud grades PreK - 9. The June Newsletter contains the featured author/illustrator: Arnold Lobel. The May Newsletter contains the featured subject: Buildings and Architecture in Children's Books. The April Newsletter contains the featured book: A Single Shard by Linda Sue Park. The March Newsletter contains the featured subject: The Great Depression and Children's Books. The Great Depression and Children's Books. The February Newsletter contains the featured subject: States and Children's Books. The January Newsletter contains the featured subject: Wind and Children's Books. The December Newsletter contains the featured author/illustrator: James Stevenson. The November Newsletter contains the featured subject: Work and Children's Books. The October Newsletter contains the featured book: Out of the Dust by Karen Hesse. There have been more web links and related books added to the Featured Book: Snowflake Bentley. The September Newsletter contains the featured book: Snowflake Bentley. The July Newsletter contains the featured subject: Your Summer Reading. The June Newsletter contains the featured subject: Looking Critically at Picture Books with Students. Looking Critically at Picture Books. The May Newsletter contains the featured subject Guided Reading in Good Literature. Guided Reading in Good Literature. The April Newsletter contains the featured subject Local History and Family Stories with books, activities and web site links. Local History and Family Stories. The March Newsletter contains the featured subject Women's History with books, activities and web site links. The February Newsletter contains the featured author Richard Peck with commentary, biography, books and links. Featured Subject: Characters as Readers. The Association of Jewish Libraries 2000 Notable Books listing is out. The January Newsletter contains the classroom theme "Flight" with picture books, novels, nonfiction, links and activities. The Newbery and Caldecott Book Awards have been announced! You can read our thoughts about them and order the books online as well as find reviews and other materials on all the books here. Educational news feeds have been added to the sidebar on this page. Please let us know how you like this new service. The December Newsletter contains the classroom theme "Winter" with picture books, novels, nonfiction and activities. The November Newsletter contains picture book recommendations for all ages in the History, Math and Science programs. The October Newsletter contains 6 new book reviews. The May Newsletter contains lots of classroom ideas for Walk Two Moons by Sharon Creech. The April Newsletter is out. Read about our favorite books of poetry. We've taken 100 more book reviews that were lurking in the background listed only in the by author sections and tied them in with the by titles and by grades listing so that now they're all easy to find. The February Newsletter contains lots of classroom ideas for the latest Newbery award winner. The January Newsletter contains a collection of resources for Martin Luther King Day. There's a new review by Knowledge Quest of our book Using Literature in the Middle School Curriculum. The December issue of the Newsletter is out. 11/23/99: Your responses to the question of how often to publish the Newsletter were overwhelmingly in favor of a shorter newsletter published more frequently. So as soon as possible we'll start sending out bonus issues. Thank you for all your kind words. The November issue of the Newsletter is out. We've installed a new search page. The old one which used Infoseek was getting crowded with advertising and links to other sites. It had become harder and harder to find the results of your searches. Now we are using a service from BeSeen which uses the AltaVista database to search our site. The results are clearer, more thorough and more up-to-date. Let us know what you think. More cross referencing has been added on many pages including cities and towns, rivers, new book reviews and many other pages. This should help people find what they're looking for. There's a new navigation bar at the top and bottom of each page including new links to the author page, and to Carol Hurst's Consulting page. You'll also notice a side bar with smaller sponsorship ads. These ads help maintain and expand our site. Please visit our sponsors whenever you can and make sure you let them know where you heard about them. Speaking of sponsors we'd like to welcome a new sponsor. MariInc.com will be running a banner ad on our home page for the first week or so every month through June 2000. They are the largest single source for literature teaching guides. They also carry paperback children's books and reading teaching resources. Check them out. 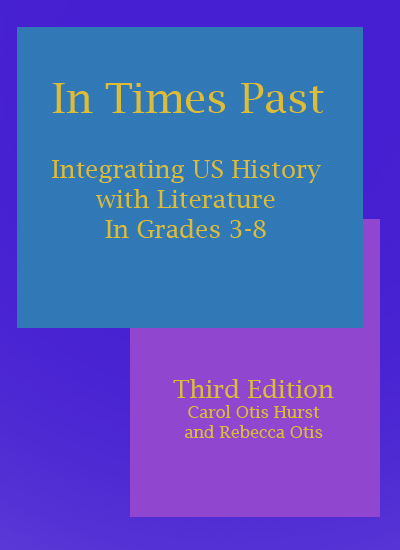 Our book Using Literature in the Middle School Curriculum was reviewed by VOYA. We've posted their kind words here so you can read it yourself. We've added links here and there including links to good lists of authors' sites. Open Books: Literature in the Curriculum Kindergarten through Grade Two. Using Literature in the Middle School Curriculum. Friends and Relations: Using Literature With Social Themes, K-2. Curriculum Connections: Picture Books in Grades 3 and Up. Great News!! There are over 100 new book reviews on the site. They have not yet been fully integrated with the previous reviews but you can find them under the by author listing. In the coming months they will be cross referenced by title, type and grade level. Check out the new pages about Carol Hurst's Consulting services. The latest issue of the newsletter is up. Now you can help support this site at no cost to you! A new deal with Amazon.com allows us to set up a special page. Shoppers who enter Amazon.com through our special page will see no difference in their shopping experience once they enter but 5% of their purchase price will be contributed to this site for further expansion. Bookmark This Page now. We also have search forms for Amazon.com at the bottom of each page which give back the same 5%. More Information. Featured Book Article on Little Blue and Little Yellow. Featured subject article on Color and Children's Literature. We have signed an agreement with CliqNow to sell ads for all our pages. We are doing this in order to fund further expansion of the site. We apologize for the intrusion into your browsing but we believe it is the best way to provide you with more content. Let us know your reactions to this. We are excited about the new possibilities this will open up for the site. At long last the January newsletter is now available. My apologies for the delay. You can view this latest issue on the web or subscribe to have it sent to your email address. Featured Subject: Picture Books in the Classroom, PreK-9.